Read here about a mechanical device useful in tensegrity structures. A winch is a mechanical device that is used to pull in (wind up) or let out (wind out) or otherwise adjust the "tension" of a [rope] or [rope] (also called "cable" or "wire cable"). In its simplest form it consists of a [spool] and attached hand [crank]. The spool can also be called the winch drum. Some may include a [brake] and/or a mechanical brake or [and pawl] device that prevents it from unwinding unless the pawl is retracted. Many different types of winches are deployed to tighten the tendons in a tensegrity structure. 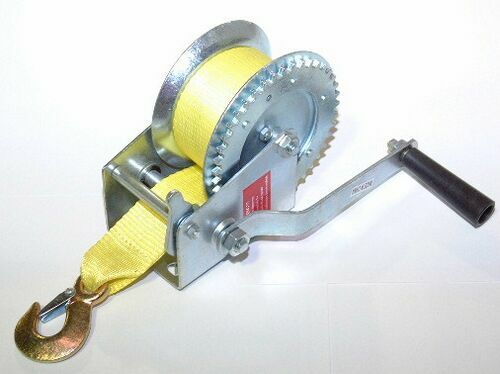 A strap winch is a manual winch with a crank. 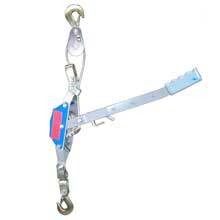 Strap Hand Winch, 1200 lb. max capacity, w/ 20' x 2" Strap. A come-along can be used to tense a tendon in order to fasten it to its target anchor. 2 ton economy come along winch. A come-along is a hand operated ratchet lever winch. A come-along is convenient and portable enough to use in almost any situation, because it is small enough to carry in one hand and weighs an average of only ten pounds (about 4.54 kilograms). A come-along is used for stretching, lifting, and lowering objects. They are available in a variety of sizes and weight lifting capacities for varying construction needs. Lifting capacity generally ranges from one to three tons (907.19 to 2721.6 kilograms), with a six to twelve foot (about 1.83 to 3.66 meters) lift height. It is important to adhere to the recommended weight limits provided with a come-along, as the device is susceptible to fatigue fractures if repeatedly operated at even a small percentage of its tensile breaking strength. Often, a come-along is designed with internal clutches in order to limit operating loads. Within these limits, however, the wire rope can rust from the inside out. In addition, the cross sections of chain links are reduced through wear. Frequent lubrication will extend the life of the come-along.